It is never an easy task to find the best flea fogger for home to get rid of fleas completely and hence you will find that these hard to kill parasites keep coming back. The problem is that they not only feed on the blood of their hosts, which could be your dog or cat but their existence results in continuous scratching leading to rashes. Among the various fleas, the dog flea is considered the most dangerous as they are responsible for spreading a type of flea tapeworm known as Dipylidium caninum. In order to tackle the problem of fleas and to get rid of flea infestation in the home, there is a wide variety of home flea foggers available. What is the best flea fogger? When it comes to deal with fleas in the house, there are variety of flea bombs available which makes it very confusing to choose the best flea fogger for your house. No Worries! We have created a list of 5 best flea foggers and bombs for your house that you can use so that you don’t have to work too hard to find the right ones. Let’s take a look at the different types of flea foggers available for home. Siphotrol plus fogger by Vet-Kem offers flea treatment for both dogs and cats. The active ingredient includes Permethrin and (S)-Methoprene are highly effective in getting rid if fleas and ticks. Permethrin is a synthetic chemical that belongs to the family of pyrethroids and it ats as a neurotoxin for adult fleas. Methoprene, on the other hand, is an insect growth regulator (IGR) that affects the growth of larvae and ensures they don't reach the adult stage. Note: It is important to vacuum your home or pet area prior to using the fogger. The Zodiac FleaTrol fogger is one of the best flea fogger for the house when you are looking out there for treating large-scale flea infestations. It is a dual-action fogger, which means it consists of two different ingredients - one is a highly powerful insecticide (Permethrin) and the other is an effective Insect Growth Regulator ((S)-Methoprene). Permethrin will kill any and all fleas and ticks upon contact while the IGR will attack the eggs and larvae and hinder their life cycle. The Zodiac FleaTrol room fogger does not leave any bad odors or ticky mess. Zodiac flea bomb Kills fleas, ticks, cockroaches, ants, spiders, mosquitoes and silverfish.It also provides the quickest, easiest and most economical way to treat fleas in the indoor environment. 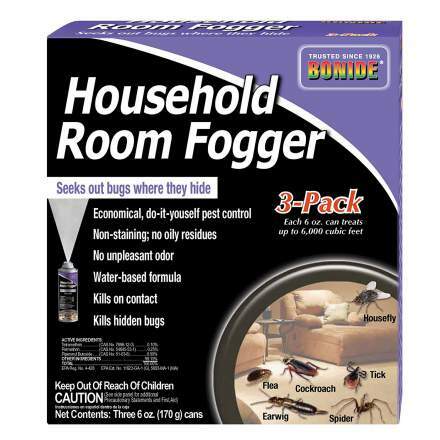 The Bonide household room fogger is a highly effective product that can kill both flying and crawling or wingless insects. It is a triple action insecticide flea fogger as it contains three different active ingredients, which are Tetramethrin, Permethrin, and Piperonyl Butoxide. All three ingredients are synthetic insecticides belonging to the family of pyrethroid and are effective in killing adult fleas. The Bonide Chemical Co room fogger is available in a pack of 3 cans. It is considered to be the best flea fogger for home especially when applied on the room, it seeks out fleas and bugs where they hide and kills them on contact.. The beauty of the product is it kills the hidden bugs and doesn't leave any stains as it is a water-based fogger. 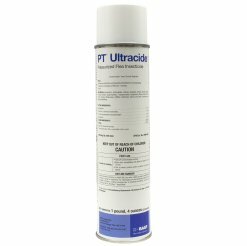 The Ultracide professional flea and tick control fogger spray has been developed specifically for indoor treatment of flea infestations. It is a highly effective flea and tick control product as it contains 3 different active ingredients and they are Permethrin, Phenothrin, and Pyripoxyfen. Permethrin and Phenothrin are chemical insecticides that are effective in killing adult fleas while Pyripoxyfen is an insect growth regulator (IGR) that kills the larvae and thus prevents re-infestation. ultracide flea bomb is available in an aerosol ready-to-use 20oz spray canister. 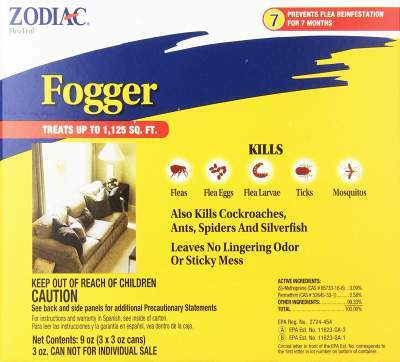 As the name suggests, this is really a "no mess" fogger that kills fleas right there and then - on contact! It comes with an odor neutralizer and deep-reaching formula that creates a fine and dry fog, which can penetrate into crevices, cracks, under carpets, and just about anywhere in your home. The active ingredients of the No Mess fogger include Tetramethrin, Cypermethrin , and Piperonyl butoxide. These are pesticides belonging to the family of pyrethroids and pyrethrins and are highly effective in dealing with fleas as well as several other household pests. 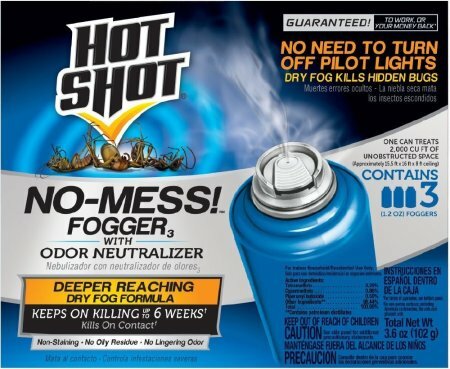 The Hot Shot No Mess Fogger comes in a pack of 3 canisters of 1.2-ounce. It can be used for treating an unobstructed area of 2,000 cubic feet. Other than fleas, it is also capable of getting rid of black carpet beetles, carpenter ants, brown dog ticks, rice weevils, cockroaches, gnats, mosquitoes, spiders, and palmetto bugs among others. Raid flea fogger is a water based fogger that Contains pyrethrins and methoprenes active ingredients to kills the fleas and hatch eggs. It Fights flea infestations inside the house and Lasts up to 4 months to provide flea protection to your home. Raid flea fogger is indeed one of the best flea killer that has non-staining formula and attacks fleas to provide maximum protection to get rid of fleas from the home fast. Fleas are all throughout unwanted creatures that attack our homes inevitably. You definitely not want this to happen in your areas, so you will do all the ways and means you think it will make them vanished away. Flea foggers or bombs are the most sought option to control fleas. with many kinds of flea bombs are being offered in the market it is really tough to find the best flea fogger. Also the please be noted that most flea fogger works on more than one kind of pests like tick, roaches where you must ready carefully when buying a flea fogger for home to eiminate fleas permanently. In fact, flea bombs are the best options and proven to work highly efficient. But beware that they contain chemicals that are possibly dangerous to your health. Can eliminate almost 80% of fleas in your house, but it is only when the treatment is repeated 2 to 3 times – this is at least once a week. Can hardly reach the sections of your house where fleas hide the most like under the couches and beds. Cannot kill the fleas on your dogs and cats, but rather they can inflict harm to these pets. How to Use Flea Bombs? Make sure that no one is inside your house except you, when you apply flea bombs. On the flea fogger container, read and understand very well the instructions written on it and assess the exact quantity needed to treat your area. Before applying the flea bomb, cover your face with a mask, then shake the fogger properly and enough to mix up its chemical contents. Push the release valve in order to open the flea fogger canister. Make sure to release fully the valve so that it will not stock up during the fogging process. Treat first the farthest part of your house while you move back towards the door. Maintain a distance to avoid contact with the cloud formed from the product. When you are finished treating your area, hurriedly run outside and close the door properly. Make sure to close also the windows when you apply flea bombs. Enter your house after at least 8 hours or depending on the instruction given on the flea fogger canister you used. You should follow strictly the time, otherwise, you are exposing and risking yourself with the chemical residues left behind. 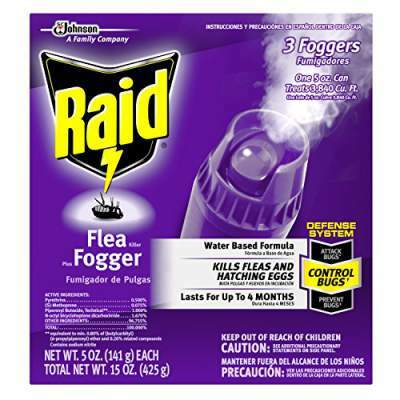 When decide you flea foggers to kill and get rid of fleas you will have to prepare your house for fogging. The below tips will be helps when you are going for fogging the house. Do not overdose your house with flea bombs - Only a single canister each room is recommended since using more than one will leave an extra amount of chemical residues that may harm your family and pets. Cover all your stuff - All foods should be placed in a tightly sealed container or better take them out from your house. Make sure to cover your dining table, kitchen utensils, cooking equipment and other surfaces and stuff that should not be in contact with the fogger residues. Store toys in a tightly sealed container since younger kids put these things inside their mouth. Always remember that flea bombs cannot kill fleas on pets, therefore, do not treat your dogs or cats with these mixtures of toxic chemicals. Shut down and unplug all electrical appliances and make sure to turn off the lights since foggers are usually made from flammable substances. Do not use flea foggers if someone in your house has asthma. The remaining chemical residues can still induce the condition’s attack even if a few days had passed after the fogging. Both flea fogger and spray has the same level of effectiveness. However, they differ in terms of their effect’s duration. Most fogging products contain pesticides that are fast acting but do not last long. Spray products, on the other hand, give you a longer lasting residual effect. Can Flea Bomb Make You Sick? Yes, if you use the flea bomb without following all the instructions given and since this solution contains unwanted chemicals then it possibly not good for both human and pets’ health. A flea bomb, which is alternately called as a flea fogger is widely used to control fleas in homes and work areas. While it helps eliminate fleas though not, in the long run, flea bomb can still be used with extra care or better not to use it since it can harm the health of your family and pets. Please be noted that the below alternates are for those who don't have to use flea bombs and to get rid of fleas naturally. These alternate definitely work but they are less effective in getting rid of fleas from your house when compared to flea fogger or flea sprays. Also most flea foggers comes with insect growth regulators. Garlic: It is an effective natural poison to fleas, but mixing it with your cat foods is not recommended. Salt: It can help eliminate fleas in your house. Fleas cannot survive in a salty environment. Salt and Borax Mixture: Sprinkle this recipe on the passage areas of the fleas to dehydrate and kill them eventually. Baking Soda: Aside from being an effective clearing agent, it can also cause dehydration of fleas and kill most of this pest stages from eggs to pupae. Make a solution and spray it on carpets and mattresses. Insecticide and Insect Growth Regulator (IGR): These will boost the deadly effect of those natural remedies applied on fleas. They contain chemicals, but with less effect on your health. In fact, salt function as a natural source of IGR. In addition, wash tough wood floors, all beddings and clean inner parts of couches. Most of the larvae of fleas inhabit the carpets so extract them out using a vacuum. 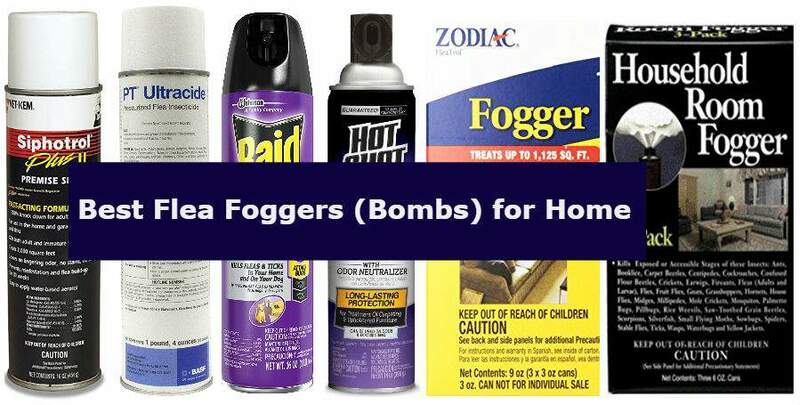 Foggers are one of the best ways of dealing with medium to large scale flea infestations and they are primarily created for indoor effectiveness. They can be used in garage space, attics, and any part of the home to get rid of fleas, ticks, and other pests. Most foggers can kill multiple species of pests or insects while some are specialists in getting rid of larvae and eggs as well. If you are planning to pick up a flea fogger for your home then it always helps if you identify your requirement in terms of type of insecticide and infestation. All the above are wonderful flea foggers to get rid of those fleas in your home. But enforcer flea fogger reviews is missing the list.